If there ever was a movie that needed to be riffed, I think Asylum's Sharknado is the perfect candidate. It's fresh in everyone's memory, it's more relevant than most RiffTrax targets, and to be honest, this in no way, can hurt the movie, but rather, make it better. And it's coming to a Fathom Event theater near you. Or pretty close to it, in one of the 650 select theaters this event is coming to. This is a Fathom event I actually might go see. I can't wait to see Michael J. Nelson, Kevin Murphy and Bill Corbett rip the Syfy channel newest classic, Sharknado on Thursday, July 10th, 2014. Just when you thought “Sharknado,” a movie about mega-cyclones sucking up sharks from the ocean and hurling them onto land, couldn’t get any more absurd, the stars of RiffTrax have blown those expectations right out of the water and created a perfect storm of funny. The sidesplitting RiffTrax crew – Michael J. Nelson, Kevin Murphy and Bill Corbett (best known for the groundbreaking “Mystery Science Theater 3000”) – is set for what may be their most epic event ever as they take on the Syfy instant cult classic "Sharknado." 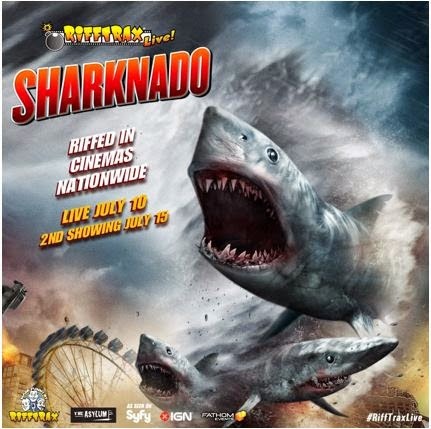 Presented by Fathom Events, RiffTrax, The Asylum, IGN and Syfy, “RiffTrax Live: Sharknado” will be broadcast live from the historic State Theater in Minneapolis to select movie theaters nationwide on Thursday, July 10 at 8:00 p.m. ET / 7:00 p.m. CT/ 7:00 p.m. MT and 8:00 p.m. PT, HI and AK, with a second showing on Tuesday, July 15 at 7:30 p.m. local time. Tickets for “RiffTrax Live: Sharknado” are available at participating theater box offices and online at www.FathomEvents.com. For Minneapolis-area fans, tickets to the live performance at the State Theatre may be purchased online here beginning May 5 at 2:00 p.m. CST. The event will be presented in nearly 650 select movie theaters around the country through Fathom’s Digital Broadcast Network. For a complete list of theater locations and prices, visit the Fathom Events website (theaters and participants are subject to change). “Sharknado” premiered on Syfy on July 11, 2013, becoming an immediate worldwide sensation, generating nearly 5,000 tweets a minute and quickly amassing nearly 400,000 social mentions. In August, Fathom Events and The Asylum held a raucous midnight showing in more than 200 theaters nationwide. Fans should also keep an eye out for “Sharknado 2: The Second One,” which will premiere Wednesday July 30th at 9/8c on Syfy. Produced by The Asylum, “Sharknado” is the story of beachside bar regulars including owner Fin (Ian Ziering, "Beverly Hills 90210"), bartender Nova (Casie Scerbo, "Make It Or Break It") and local drunk George (John Heard, "Home Alone") as they team up with Fin’s ex-wife April (Tara Reid, "Scrubs") to investigate the ecological nightmare that has sharks swimming through the streets of Los Angeles and falling from the skies.